Schools Guides are A4 sized, high gloss magazines covering a wide range of private schools in each region. Territory Edition. • Victoria Edition. • Sydney Edition. NEW VIC EDITION 2018 - Available NOW. 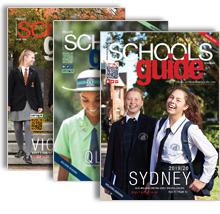 Production is now underway for the Schools Guide Victoria edition 2019. NEW QLD/NT EDITION 2017/18 - Available NOW. Production is now underway for the Schools Guide Queensland and Northern Territory edition 2019. SYDNEY EDITION 2018 - Available NOW. New Sydney Edition OUT NOW. The Queensland/NT Schools Guide presents a world of information on private schools and non-government schools from all parts of Queensland and the Northern Territory including all Brisbane private schools. Schools Guide Victoria edition presents information on private schools and non-government schools from Victoria including all Melbourne private schools. The new Sydney Schools Guide presents schools from the Greater Sydney region including central Sydney, North Sydney, Western Sydney, Southern Shire areas, Parramatta and the Central Coast. Each Guide includes representative examples from every region and every size and type of non-government school. From Anglican and Catholic private Schools through Jewish, non-denominational and Steiner, and the smallest to the largest, there is a school to suit everyone. Each region has its place in the Schools Guide. For example, in the Qld/NT edition, private schools from as far south as Tweed Heads on the southern Queensland border through the entire state north to Cairns and west through the Northern Territory have been included. The Qld/NT Guide has been divided into 12 colour-coded regions to make it as easy as possible to follow while the Vic edition has 8 colour coded regions. At the end of each section is a complete list, including contact details of every non-government and private school in that area, from preschool through to year 12. There is also a detailed map of each area. The Schools Guide works in conjunction with a wide range of non-government schools in each edition to present a succinct outline of the atmosphere, history, goals and philosophies of each. An article accompanies each school's latest promotional advertisement which gives parents and students an unprecedented glimpse into each school's heart and soul. The editorial pieces highlight the areas each school holds as being critical to their ideology, with features such as traditions, teaching and discipline strategies, learning pathways, resources, values and goals given particular focus. It has never been so easy to find the right school! The Guides have been divided into colour coded geographical sections to help parents find a school in their local area or area of their choice. Preceding each section is a map of that area plus a list of the transport service providers and their contact numbers. In many cases the schools have been plotted onto the map to make a parent's job even easier. Plus, the distance from the local train station has been included where train networks exist. No more confusion about how your child will make his way to and from school! Each geographical section of the Guide contains a comprehensive list of every non-government and private school in that region. Included for each school are suburb along with phone and fax numbers - helpful for parents who wish to make their own enquiries about a particular school. Plus, for every one of over 100 featured schools we have included added information such as...Email, Web and Street Address, Colour School Crest, Year Levels, Annual Fees (most schools), Student Population, Religious Affiliation, CRICOS Provider Number, and whether the school is for boys, girls or co-educational and whether boarding is available. A world of information at a glance! Every featured school has provided the Guide with its current promotional print advertisement to accompany its editorial feature. In those cases where schools have no promotional material available, the Schools Guide has worked at length with the school to develop a full colour advertisement which will represent the heart and soul of the school, and give readers a 'feel' for the atmosphere and philosophies that school represents. Schools jump out of the pages in full gloss colour, making choosing your favourites a breeze! WHETHER YOU ARE SEARCHING FOR A SCHOOL IN YOUR LOCAL AREA, MOVING FROM INTERSTATE, OR YOU'RE AN INTERNATIONAL STUDENT CONSIDERING SCHOOLING IN AUSTRALIA, THERE IS SOMETHING IN THE GUIDE FOR YOU. NO STONE HAS BEEN LEFT UNTURNED TO GIVE YOU THE BEST CHANCE OF FINDING THE RIGHT SCHOOL. Available all year round and updated annually, the Guides are available in hundreds of child care centres across each state or available for purchase on this secure website. DON'T TAKE A STAB IN THE DARK...AND DON'T WAIT A MINUTE LONGER... ORDER YOUR COPY OF THE SCHOOLS GUIDE NOW! YOUR FIRST STEP TOWARDS EDUCATIONAL SUCCESS BEGINS HERE. Would you like free copies to give your clients? Our team travels all over Victoria, Qld, NT and soon Greater Sydney distributing free copies each year. Simply contact us and we'll add you to our distribution list. Or, if you need free copies NOW simply pay for the postage and we'll send you all the copies you need. Contact us on 07 55 202 835 to arrange a bulk postage order.